This park protects more than 85,000 acres of slowly moving fresh water that constitutes the largest strand swamp in Florida, contains the second largest tract of old-growth bald cypress, and harbors 38 species of ferns, 14 species of bromeliads and 44 species of native orchids. Florida Panthers and Florida Black Bears also call this preserve home but sightings are very rare. 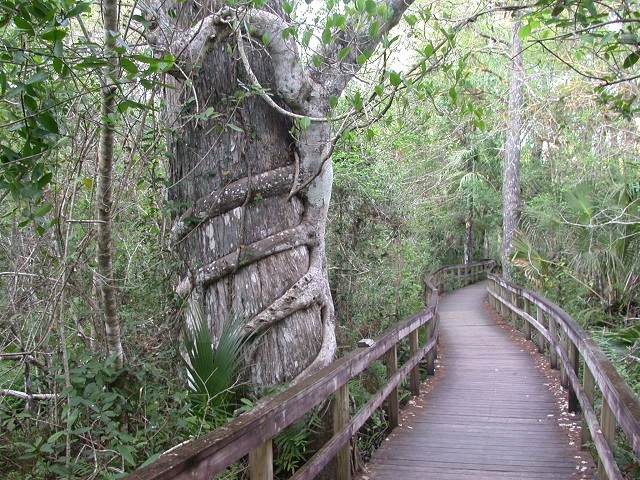 The Big Cypress Bend Boardwalk in the southern end of the park off US 41 is a half-mile trail into an old-growth cypress forest, giving close-up looks at lots of waders, nesting Bald Eagles, plus warblers and vireos during migration. The 11-mile unpaved Janes Scenic Drive is currently in very bad condition (March 2017) and may only be suitable for 4WD vehicles. We recommend calling the park before your visit for an update on the condition of the road.